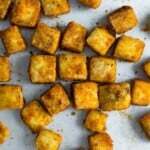 This simple baked tofu recipe is delicious as a snack or entree, and is so easy to prepare! Vegan & gluten-free. This year I’ve been challenging myself to add more vegetarian dinners to our weekly meal plan to reduce our impact on the environment. We’ve been pretty steady at 3 vegetarian meals per week, and tofu has made its way into the rotation. I love tofu because it keeps in the fridge for quite awhile, which means if I forget to thaw something out, I have an option waiting for me. Tofu has a bad rep for being bland, but this baked tofu recipe is anything but! 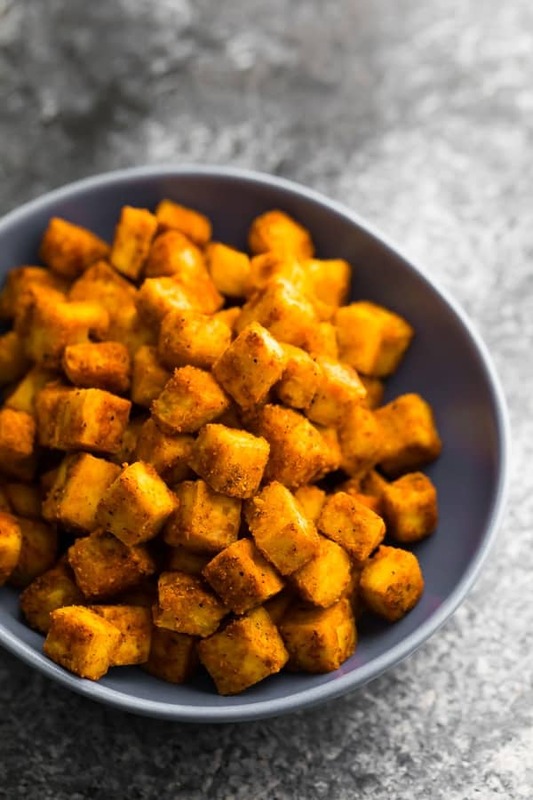 Tossed in a delicious spice blend and baked to perfection, these tofu cubes are highly addictive! Tofu- use extra firm for this recipe. Press– pressing the liquid out helps this tofu get a nice, almost crispy texture in the oven. Cut small– I cut my block in thirds horizontally, then across the block to get 1/2-3/4 inch cubes. Cornstarch– first toss in olive oil, then in cornstarch. This helps keep any extra moisture from the surface of the tofu, helping it get a better texture. After preparing your tofu, you will bake for 45 minutes- 1 hour. 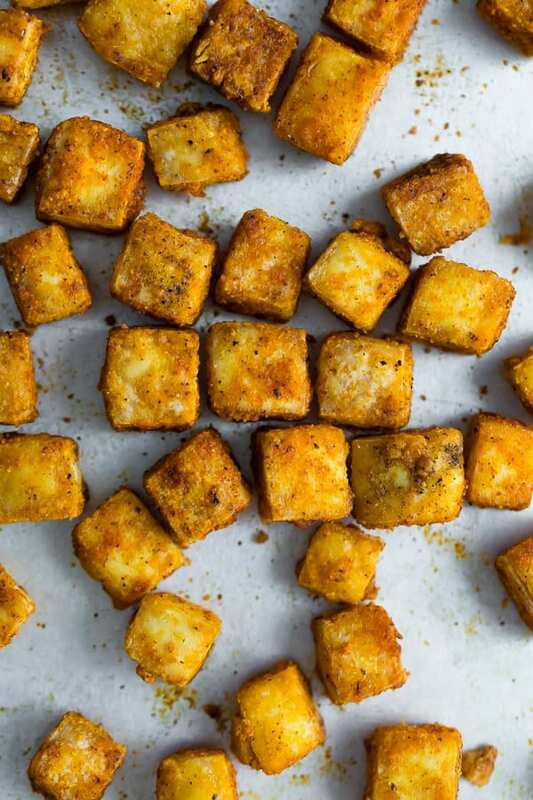 Does this baked tofu recipe get crispy? Almost. I wouldn’t go so far as to call it crispy, but it does get crispy as it cools down. However it has a delicious (almost chewy) texture that is so different from how it normally tastes. 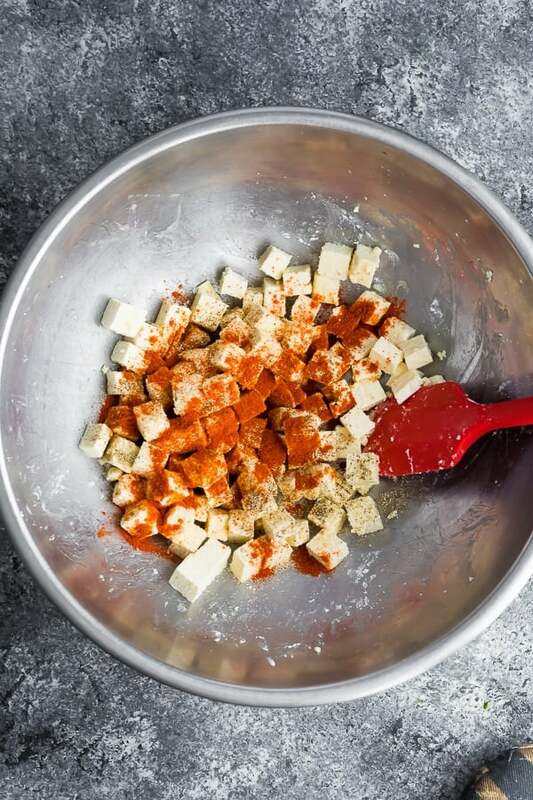 Can I use a different seasoning blend on this baked tofu recipe? Sure! I have 7 Dry Rub Recipes which you could use as seasoning for this recipe. I bet the lemon herb and Indian spice blends would be so yummy on tofu! 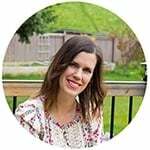 What can I use as a dip for this baked tofu recipe? 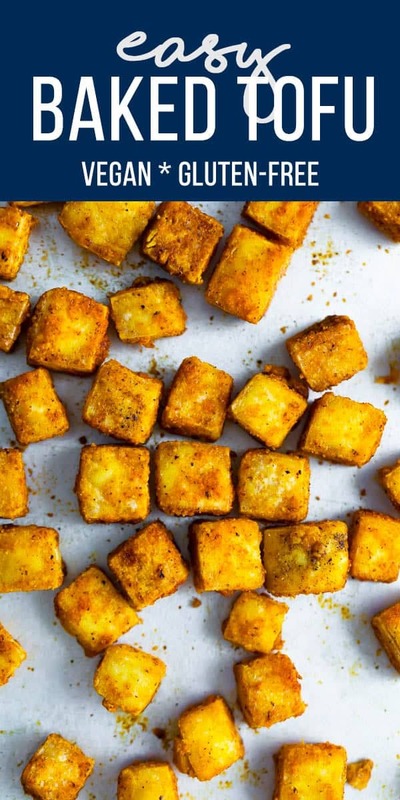 This baked tofu would be fantastic served with dip. Honestly, we gobbled it up without a dip, but I would love to serve it with ranch (I have my eye on this vegan ranch dressing! ), my favorite homemade hummus recipe, this maple tahini dressing, or the almond butter sauce from these cold sesame noodles. What to serve with baked tofu?
!) and wished I had sooner! 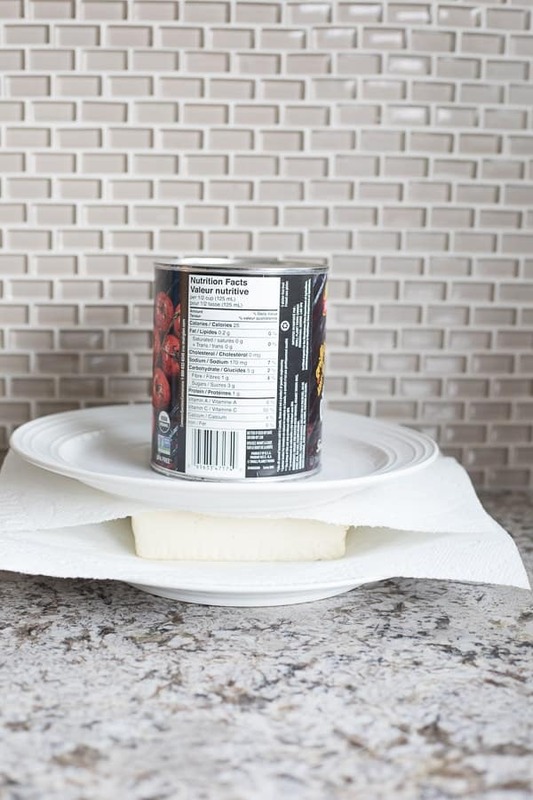 Press tofu: sandwich between paper towels and two plates. Place a heavy object (like a 28 oz can) on the top plate. See photo in post for a visual. Press for 30 minutes or more. 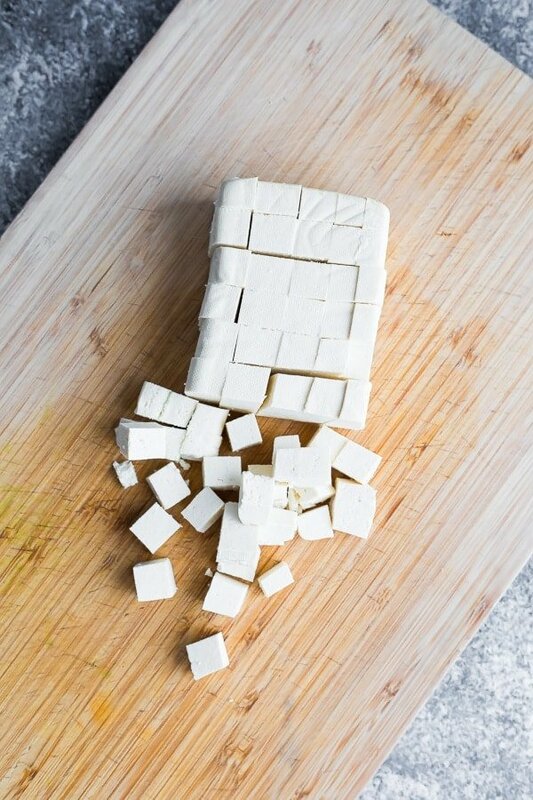 Cut tofu into 1/2 inch or 3/4 inch cubes. Toss tofu in olive oil, then in cornstarch 1 tablespoon at a time. Toss tofu in all remaining ingredients, then arrange on a large baking sheet. Bake for 45 minutes - 1 hour, until cooked to your liking. Made this tonight, following the recipe as written. I liked the cruchiness but felt it was a little band. Will try again using a different seasoning. Thank you for sharing. Looks so delish! Do you think it would keep if I used it for four servings of a lunch prep? Hi Veronica, so sorry about my late reply! It will still taste good, but won’t be crispy. Hope you enjoy!